I bought this book about 15 years ago when I was making my post high school attempt at being a good chess player. I don't remember how far I actually got in this book, or if I ever even read it. This book contains 239 endgame problems. The format is 1 diagram and explanation per page with a few exceptions for longer solutions. I downloaded a pgn copy of this book and copied the diagrams to make flashcards. All the errata was fixed in the pgn except for endgame 137 which I corrected. Some of the problems are subproblems of well known endgames like the Lucena. The subproblems walk you through the component parts of the overall solution and finally finishes with the entire problem. I found this to be an excellent book for my level and a great learning experience. The format is very compatible with spaced repetitions. I was not doing speed training with this, although someone with a better background in Endgames may be able to use the book in that fashion. For me, it was a lot of learning. Repetition 1 for me is just learning the material and keeping track of which ones I got right. 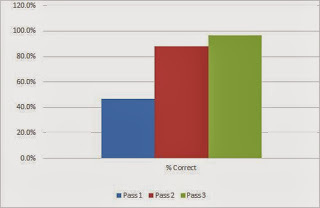 I didn't keep track of speed, but percentage of correct answers. I broke the problems down into 4 sets A-D. I skipped 1-11 as these were elementary checkmates that didn't need any type of revision. I skipped 113 as it's a problem on Corresponding Squares and doesn't say much other than a general overview of the theory and that there are no simple formulas to calculate the squares in any given position. Between that and the 14 move solution, I decided to save it for another day. I skipped 199 since it's a bust. It's a win for black, not a draw for white. Set A - Endgames 12-69 : Minor piece checkmates, QvR, RvB, RvN, RBvR and some KPvK endgames. Set B - Endgames 70-128: KPvK and KP endgames with multiple pawns on either side. Set C - Endgames 129-184: Q/R/B/NvP, KB/NP v K(P), QvRP, QP v RP, QPvQ endgames. Set D - Endgames 185-239: RPvR and B/NP v B/N endgames. I wasn't going for speed, but learning. I kept track of correct/incorrect answers in my spreadsheet. If, after the 3rd repetition, I was wrong three times or sometimes two times and struggling on the 3rd, I put the starting position in Arena and forced myself to play the endgame against Houdini until I got it right. Each endgame type has it's own PGN file and is also on its own repetition schedule. I'm essentially double studying the ones I'm having trouble learning. I think it's having an effect and is a good simulation of OTB play since I force myself to play it like a real game. Not bad at all. 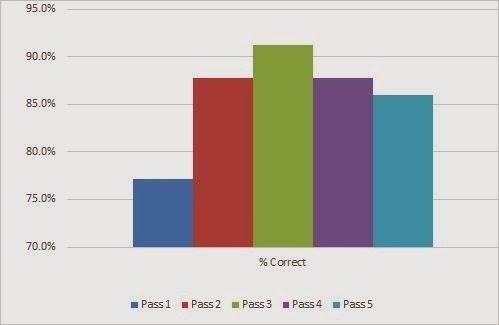 Started with 77.2% improving to 91.2% after pass 3. A small decline to 86% as the repetitions have gotten farther apart. My only real difficulty with this set was the Philidor RB v R positions. I didn't start my Houdini repetitions with this until after Pass 5, so I won't know how much of an effect it's happening until 12/24. From Wikipedia, RBvR is one of the common pawnless endgame, but it's generally a draw (Mednis estimated it as a win about 4% of the time in positions that could actually arrive from a game). Probably not very practical for converting wins, but very practical in knowing that it's mostly a theoretical draw should I end up a piece down. Now I have to study the Cochrane defense at some point. If the position doesn't fit, you must acquit? It's covered in Howell's Essential Chess Endings, which is next on my endgame reading list. I've read through Class C in Silman's Complete Endgame Course and haven't come across it. A quick scan of the contents doesn't suggest that it's listed at all. I plan to get through Class A before moving on to Howell. 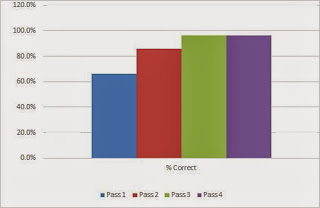 Unfortunately, I forgot to record the results of pass 4. But you can see the same steady improvement. Pass 1 at 46.6% up to 96.6% by pass 3. I haven't had any repeating difficulties with this set, which is good news since King and Pawn endgames are so common. I knew about the opposition, but having it explained in terms of critical squares really helped my learning. Really like the outflanking maneuvers against locked pawns as well. I'm at the point when I can see a future position and say "and wins" or "and draws". Another set that I'm not having any difficulty with. 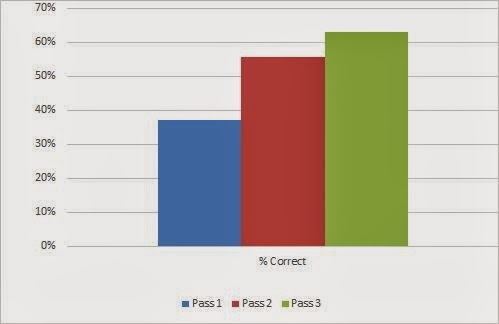 Improvement from 66.1% to 96.6% which has held through the 4th pass. And this is basically the opposite of set C. Lots of difficulties for me in the RP v R endgames. A lowly 37% on pass 1 which improved to 63% by pass 3. I just started my Houdini repetitions for the ones I had problems with. I will know on 12/20 if it is having an effect. I don't know how many total repetitions I will do for each set. My goal is to finish the Silman Endgame book through Class A, make any repetitions as necessary then start on the Howell book. I don't know what the format of that book is and if it lends itself to repetitions like the Pandolfini book. If not, my next exercise book is probably going to be Pandolfini's 111 Winning Endgames followed by Alburt & Krogius's Winning Chess Endgames.